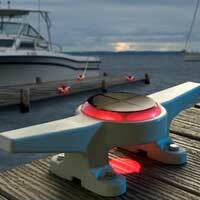 Solar Light Safe T Cleat can be mounted on any flat surface including docks, seawalls, and diving platforms. The hardware of the Solar Light Safe T Cleats is available in black, ivory and clear. Solar Light Safe T Cleats are available in 4 colors of lights – blue, green, red and white.